Habit: Shrub, tree. Leaf: odd-1-pinnately compound [not], petioled, deciduous; leaflets generally toothed, terminal partly fused to uppermost lateral(s) or not. Inflorescence: panicle, many-flowered; pedicel bractlets 0. Flower: hypanthium bractlets 0, stamens generally 20; ovary generally inferior, chambers 1--5, styles 1--5, generally free. Fruit: pome, generally spheric, chambers 1--5, 1--2-seeded. Species In Genus: +- 130 species: northern temperate, tropical Asia. Etymology: (Latin: ancient name) Note: Species intergrade. Habit: Shrub 1--5 m; stem-buds 8--14 mm, shiny, sticky, hairs generally sparse, +- white. Leaf: leaflets 7--13, 3--8 cm, 1.5--3 cm wide, lanceolate, oblong, or ovate, shiny adaxially, axillary hairs +- white. Inflorescence: pedicels hairy. Flower: petals 4--6 mm, ovate. Fruit: 8--12 mm, orange to red-orange, glaucous or not. Seed: 4--5 mm, ovate, flat, brown. Chromosomes: 2n=34, 68. Synonyms: Sorbus cascadensis G.N. Jones; Sorbus scopulina var. cascadensis (G.N. Jones) C.L. Hitchc. ; Sorbus sitchensis M. Roem. var. densa Jeps. 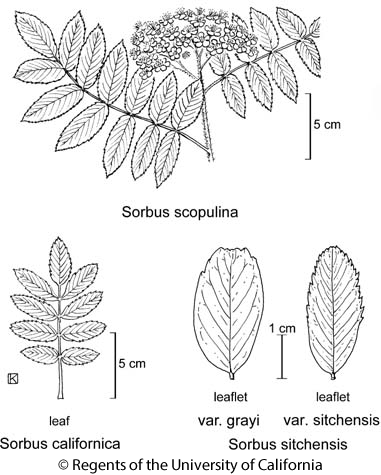 Citation for this treatment: Peter F. Zika 2012, Sorbus scopulina, in Jepson Flora Project (eds.) Jepson eFlora, http://ucjeps.berkeley.edu/eflora/eflora_display.php?tid=44988, accessed on April 19, 2019. KR, NCoR, CaR, SNH, MP; Markers link to CCH specimen records. Yellow markers indicate records that may provide evidence for eFlora range revision or may have georeferencing or identification issues. Purple markers indicate specimens collected from a garden, greenhouse, or other non-wild location.